Can Above Ground Pools Use Salt Water? Posted on December 7, 2018 December 10, 2018 , in Above Ground Pools. Many owners of traditional chlorine-based pools have some curiosity about salt water systems. They may have heard that salt water pools require less maintenance, rely less on harsh and potentially hazardous chemicals and provide a more comfortable pool environment that is easier on the eyes and skin. But can above ground pools use salt water? Depending on the composition of your above ground pool, you might be able to convert your traditional chlorine system to one that uses salt water. This article will go over the conditions necessary and the steps required for such a conversion. Contrary to what many people believe, a saltwater pool doesn’t completely eliminate the use of chlorine in the water. What a salt water system actually does is utilize a chlorine generator to convert salt into chlorine by a process known as electrolysis. This, however, eliminates the need to handle and store chlorine which many pool owners (especially ones with small children) find to be somewhat of a hassle. Also contrary to popular belief, saltwater pools also don’t have concentrations of salt anywhere near that of the ocean. In fact, a saltwater pool salinity is about 10% of that found in the sea. What Might Prevent Conversion to a Salt Water System? One consideration of saltwater systems that needs to be taken into account is the price. They are more complex and more expensive than traditional chlorine systems. And although generally maintenance free, because of the complexity of salt water systems, if there are any problems, maintenance issues usually require hiring a professional technician. The composition of the various pool components will also play a role in whether you’ll be able to easily convert to a salt water system. Salt water can be corrosive to certain materials, so you’ll have to ensure your pool liner, masonry work and mechanical components are saltwater resistant. Aluminum and certain types of resin are much more capable of withstanding salt water damage than other materials. 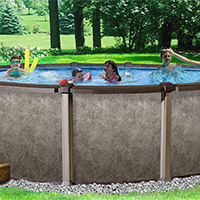 There are upgrade kits available that assist in preparing a pool for a saltwater conversion. If you decide to take the plunge, you’ll need to build in any conversion kits necessary to prepare your pool to handle salt water. This may mean installing a sacrificial zinc anode or other upgrade kits to prevent corrosion. Once the new components, including the salt chlorine generator, are installed, empty your pool and refill it with fresh water. Depending on the system you’re installing you’ll either add salt during the refilling or after it’s been completely filled. The system can be turned on after the pool is filled and the salt content of the water is optimized. After running the new system for 24 hours and testing the water for chlorine levels your new saltwater pool should be ready for use. Now that you know above ground pools can sometimes use salt water systems, download a buyer’s guide to learn more about our pools.